I was born in 1971, Nagano Prefecture, Japan. My parents run an apple orchard in Nagano. I was trained by my parents from childhood to become a professional farmer. It had always been my father’s wish that I follow his footsteps and take over the family business. Unfortunately for him, I chose to follow my own dreams and ambitions, to this day doing what I like the most. 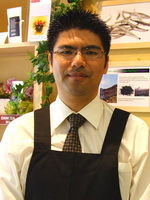 Worked in Japanese food industry for 10 years. R&D Manager and later Factory Manager for the Malaysian subsidiary of a Japanese spice and herbs manufacturing company. I am familiar with Japanese and Chinese tea ware and its effect on the various kinds of tea. In particular, I am very familiar with purple clay, red clay and tetsubin (cast iron) tea ware. 1. Fishing: I love fishing more than eating. I usually go to the alpine river to fish trout. 5. Used to love tennis but recently my body can’t keep up with this rigorous game. 6. Used to be very crazy in Mogul skiing. But I can not afford to risk myself anymore. My dream is to live on a self-sufficient lifestyle. I live half of the year in Nagano. Nagano is very rich in nature. Nagano is a well-known place since we had hosted the Winter Olympic Games back in 1998. I live the other half of the year in Malaysia, where I directly face and come into contact to the modern tea culture and my customers. I believe that tradition is a series of innovation. It is important to deal with tea from more scientific and logical approach in order to keep up improvement. I love to verify the myths that exist about tea one by one and come up with my own theories from a logical point of view.